We’re pleased to be included in Washingtonian’s January 2017 issue as “The Face of Luxury Condo Renovations.” Our team certainly has the depth and breadth of experience, relationships and specialized methodologies needed to be successful on the most complex of condominium remodeling projects. If you’re considering the luxury condominium lifestyle, then your first call should be to BOWA. 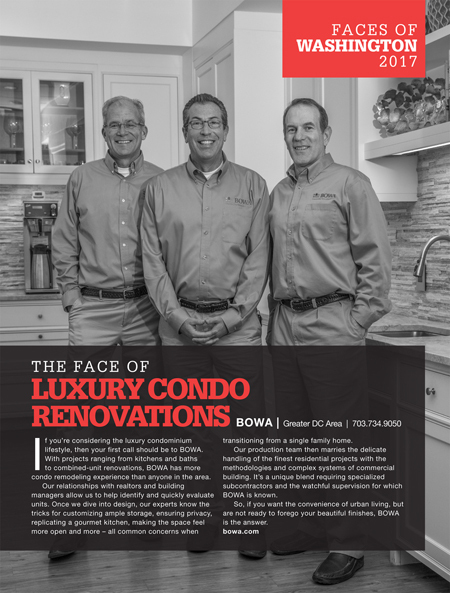 With projects ranging from kitchens and baths to combined-unit renovations, BOWA has more condo remodeling experience than anyone in the area. Our relationships with realtors and building managers allow us to help identify and quickly evaluate units. Once we dive into design, our experts know the tricks for customizing ample storage, ensuring privacy, replicating a gourmet kitchen, making the space feel more open and more – all common concerns when transitioning from a single family home. Our production team then marries the delicate handling of the finest residential projects with the methodologies and complex systems of commercial building. It’s a unique blend requiring specialized subcontractors and the watchful supervision for which BOWA is known. So, if you want the convenience of urban living, but are not ready to forego your beautiful finishes, BOWA is the answer. For quality, value and an experience you can enjoy, call BOWA first for your next condominium renovation project.